Preheat oven to 400. Line a baking sheet with parchment paper. Set aside. Flour a clean, flat surface. In a bowl of a stand mixer or a large bowl, whisk together the dry ingredients. Add the cheese and butter and slowly mix until the butter is in small, pea-sized pieces. Slowly pour in the milk and mix just until a dough forms. Place on the floured surface and roll the dough until it is 1/2 thick. Cut 3-inch rounds out with a biscuit, cookie or doughnut cutter. Place on lined baking sheet. Brush with beaten egg (optional). Bake 20 minutes or until golden brown. Melt about a tablespoon of butter to a skillet. Add the sausage and cook, breaking up large chunks with the back of a spoon, until browned. Sprinkle with 1/4 cup flour and spices and cook 1 minute, stirring constantly. Stir in the milk. Cook, stirring continuously until the mixture thickens. Pour over biscuits. Garnish with chives or garlic chives if desired. Let's be honest, sausage gravy doesn't look appetizing on a good day, no matter how tasty it is, and throw in chorizo which turns the whole mess an "interesting" shade of orange, well it isn't going to win any beauty contests. I garnished it with some garlic chives but really, nothing is saving this. Luckily, food does not have to look pretty to be delicious! I've had the idea of making it with chorizo for ages now but never got around to actually making it. I saw a perfect square of bulk chorizo in the supermarket last week so I popped it in the cart thinking I'd freeze it for later use. Then this freak March storm came and we are stuck here so I thought now is my chance to make the sausage gravy of my dreams. I will say, this is a special treat sort of breakfast (or lunch, in our case) what with the sausage, the gravy, and the cheddar-spiked biscuits but it is worth it! It is also surprisingly easy to make, while the biscuits are cooling, make the gravy and the whole thing from starting the biscuits to making the gravy only takes about 40 minutes. Depending on how spicy you like it and how spicy your sausage is, feel free to add some cayenne to the sausage as it is cooking. The end result is great: spicy sausage gravy tempered by the sharp cheddar-spiked biscuits. 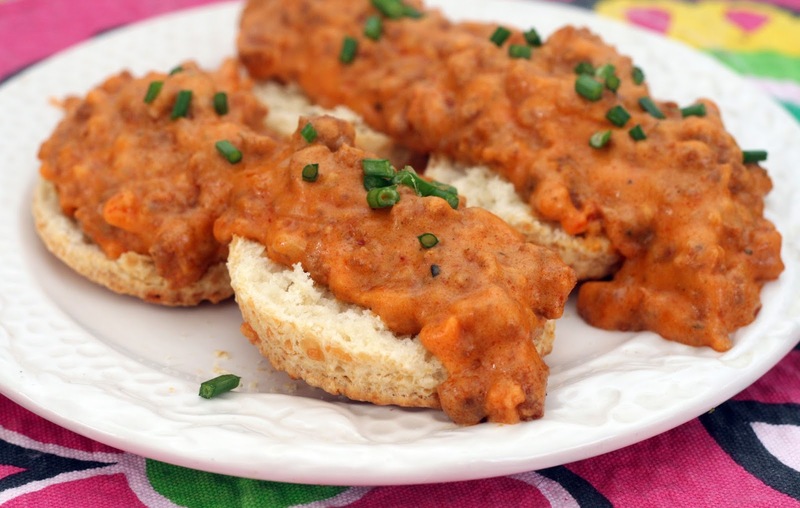 A feisty, fiery twist on a Southern classic.